The SmokeDetector project is over three years old at this point. It's grown from a small python script to a decently sized application that integrates with another project. In that time, it's expanded what types of spam and patterns it looks for, what chat rooms it posts to, what external services it integrates with and how permissions to use the system are determined. A lot has changed under the hood. I was hoping to put a cool chart here showing code change over time, but some early decisions with the project really throw off the chart. Using a Ship of Theseus analogy for code, you can see how much has changed. The basic idea is, if a ship leaves port and replaces every plank along it's journey, is it still the same ship when it returns? With code, the idea is to apply this to lines of code in an application. In late 2014, the project attempted their first machine learning method of detecting spam. In this time period, a commit was added that added about 200,000 lines of code to the project. This was almost all training data for a Bayesian algorithm. It wasn't needed and probably shouldn't have been added to the main repository. Unfortunately, it stayed in the repository for over a year and was finally removed in late 2015. This is the cause of the weird graph above, and why almost everything added in 2014 looks like it's missing in later years. After eliminating that Bayesian directory from git history, you can get a much better idea of how much has changed. Very little of the original code, written in 2014, remains untouched. The explosion in code after that is due to new detection patterns, chat commands (and a rewrite), integration with MetaSmoke and the introduction of blacklists. 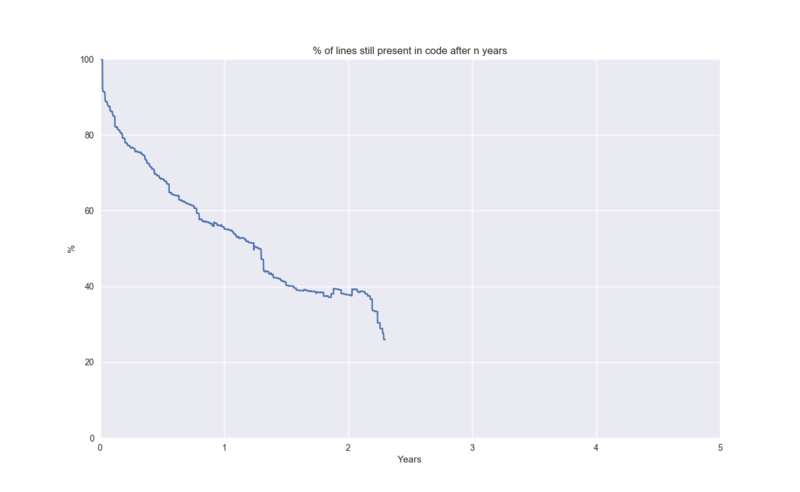 Even more dramatically, you can see how long a line of code is expected to survive in the code base. 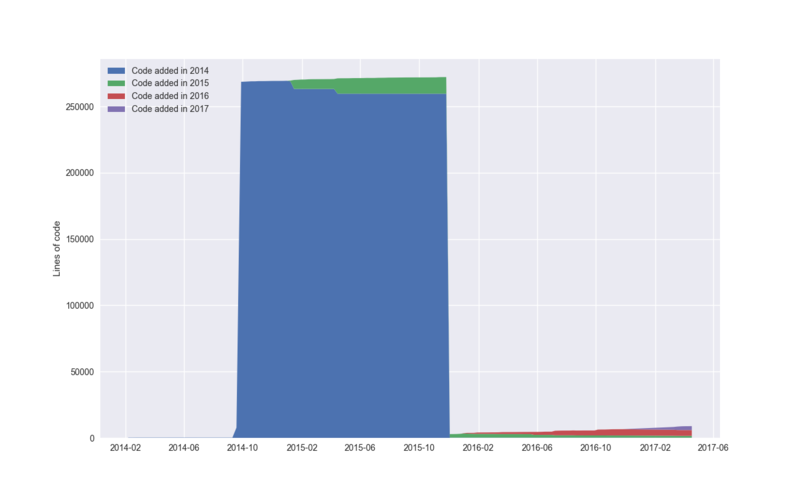 Within one year, the team is removing over 40% what's been committed to the repository. Looking at these commits, it was determined that a vast majority aren't even code. They are new items to blacklist or new patterns to detect. All of this type of data can be stored in a database and managed outside of code. In early 2017, those discussions started taking place. Several team members come from a Ruby background and were familiar with it's ORM method of accessing databases. They wanted something similar when a database was brought into SmokeDetector. A bit of research was done and it was narrowed down to peewee and SQLAlchemy. 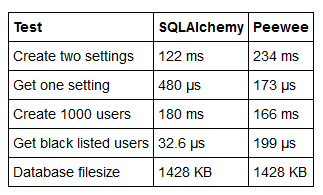 [...] SQLAlchemy is the gold standard for ORM in the Python world. It has a very active community and a maintainer who is committed to excellence. If you're a glass-half-empty guy, to put it another way, you can't go wrong if you choose SQLAlchemy. The weaknesses they list for using their own package is the smaller ecosystem, support and number of developers. That's a boring story though. Not to be deterred from such a glowing review from a competitor, I wanted to see what the technical differences were between the two solutions. To that end, I put together a small Python notebook showing the differences between peewee and SQLAlchemy in a handful of tests. These tests included inserting two settings in an SQLite database, retrieving one, inserting a large list of users and then retrieving a subset of those users. The two libraries each took two tests (out of four) for being faster than the other. In both cases where SQLAlchemy was faster, it was between two and six times faster. Where peewee was faster it was between a fraction faster and twice as fast. The time scales are so small though, and SmokeDetector doesn't need to have thousands, hundreds or even tens of hits to the database a second. A hundred extra milliseconds isn't going to cripple anything it handles. Thus, the choice was made based on the recommendation of the author of the peewee library. SQLAlchemy has a larger community and better support.